The artist Gloria Kearing is a well-respected Bindjareb woman of the Nyungar nation. Her works have been included in Pinjarra Massacre Memorial exhibition and tour. Since January 2011 Gloria Kearing and Karrie-Anne Kearing-Salmon have been collaborating with Caroline Nilson of the Nursing Program at Murdoch University. Both women are committed to establishing programs in their community: to develop health literacy; health awareness; and skills to engage in healthy lifestyle choices. -Travel Lines Erskine, commissioned by National Lifestyle Villages, Mandurah in 2009. 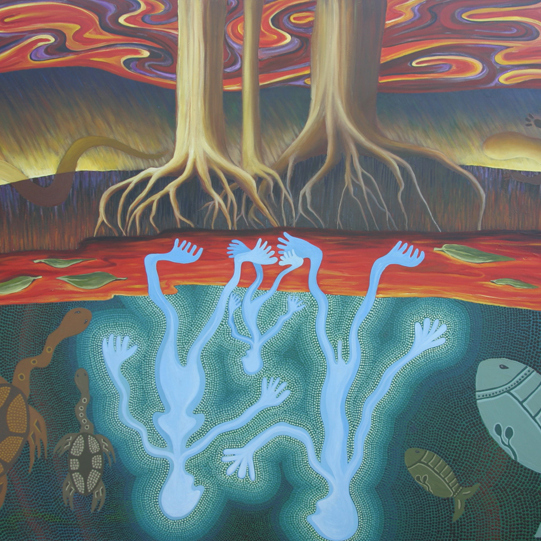 -Heritage Art Award, Reconciliation category, Australian Heritage Commission in 2000. -Santalum Circus Park commission for MIRVAC Mandurah WA. -Mural and relief artworks for the Tour Reception Centre commissioned by Alcoa World Alumina, Pinjarra WA in 1996. It’s a place of life-giving beauty as a river, also a place of great sadness because of the poignant tragedy that was the massacre of the Bindjareb Tribe. We need to remember the consequences of ignorance and greed.